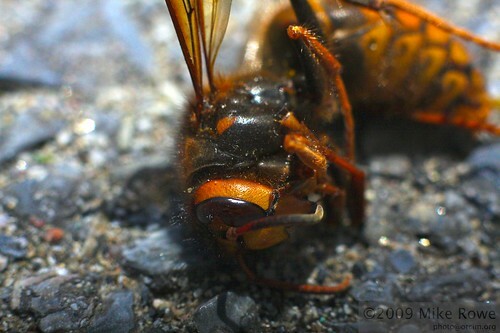 Giant killer bee’s of doom!!! These things really impressed me. Yeah, sure it was a while back, but I’m getting round to posting it now. OK? Imagine the scene. 4th period, just before lunch. About 12.15pm or so. Hot summers day, so windows open, fans on. And buzzzzzzzz, buzzzzzzz, squeal. 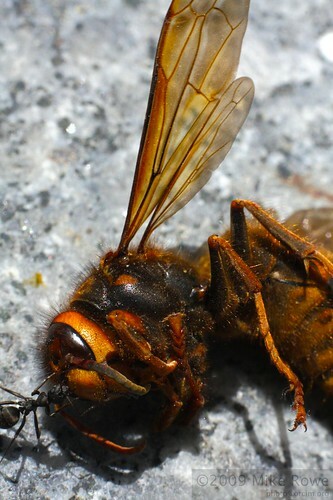 Yup, the giant bee of doom had entered the classroom and was buzzing around the girls near the windows. Not all that surprisingly they freak out. This aint your ordinary honey bee. Its over an inch long and looks like demon spawn. One of the boys is their knight in shining armour. Well, not shiny and not armour, but you get the drift. Anyhow, he arrives from the other side of the classroom, sandal in hand, a killer look in his eye. Splat. Bee is not so happy anymore with part of it smeared on the window. The rest is tossed out of the 3rd floor window onto the footpath below. Lunch comes and goes. Luckily I remember that I brought my camera, tripod and extension tubes today. So there I was for a while, grovelling in the dirt trying to get in focus pictures of a giant killer bee of doom being eaten by ants. The combo of a canon 50mm f1.8 lens and some extender tubes really can work. Even having to be my own autofocus it was possible. Tripod really helped keep it all together.